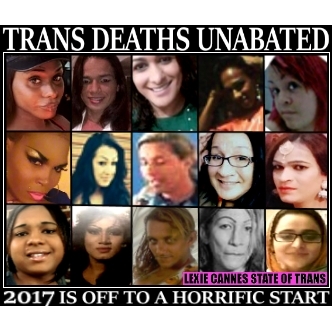 LEXIE CANNES STATE OF TRANS — Although I no longer actively track transgender murders, a visit to the Transgender Violence group page on Facebook indicates that the rate of trans murders since the start of the year appears to be as horrific as it ever was. With the current state of presidential politics dominating our news feeds, it is all too easy for the killings of our transgender brothers and sisters to slip under the radar. Let’s take a moment here to remember those who were murdered and why we fight for our place in society. This list was compiled from only one site and are of deaths that occurred during the past 8 weeks or so. There are most likely additional deaths that have not been reported on or posted at the Transgender Violence page. Please be aware unlike earlier reports I’ve done, I have not confirmed any these deaths, but I’ve no reason to doubt the accuracy of the information posted in that group. The following list does not include suicides or death by police action. Brazil: Ágatha Mont, Paola Oliveira, Lady Dayana, L.C. Marinho, Juninho da Mangueira, Michelle Rios, Dandara, Bel Ziza, Jake Helen, Aila Fontinelly W. H. Soares dos Santos, Sandra, and Moranguinho. At least one person remains unidentified. Pakistan: Hina Shahnawaz and Muskan. The very hardest part of being an activist, member or ally in the Trans Community is how we follow the horrific murders of people in our community. In each one we are in our minds stabbed through the heart, shot repeatedly through the body or bashed until we lie bleeding to death. We die over and over and over again and scream to the heavens for it to stop – please just stop. maybe it’s time we start to bash back, or at least learn self defense skills. Trans violence is NEVER acceptable in any form, under color of law or in the military.